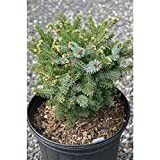 Picea omorika growing tree or shrub of the genus Picea also known as Serbian spruce, Picea omorika perennial pinophyta used as ornamental shade plant also can grow as bonsai, grow temperate climate and growing in hardiness zone 2-8. Leaves color is green or bluish gray, needle like shape connected in the base of the leaf. Picea omorika SERBIAN SPRUCE Seeds!